HALF MILE FROM THE UNIVERSITY OF NOTRE DAME AT HEAVILY TRAVELED AND EASILY ACCESSIBLE CORNER OF CLEVELAND ROAD AND JUNIPER ROAD. Currently zoned residential, possible rezoning to O office or multi family. Perfect for professional office and/or multi-family development opportunity! 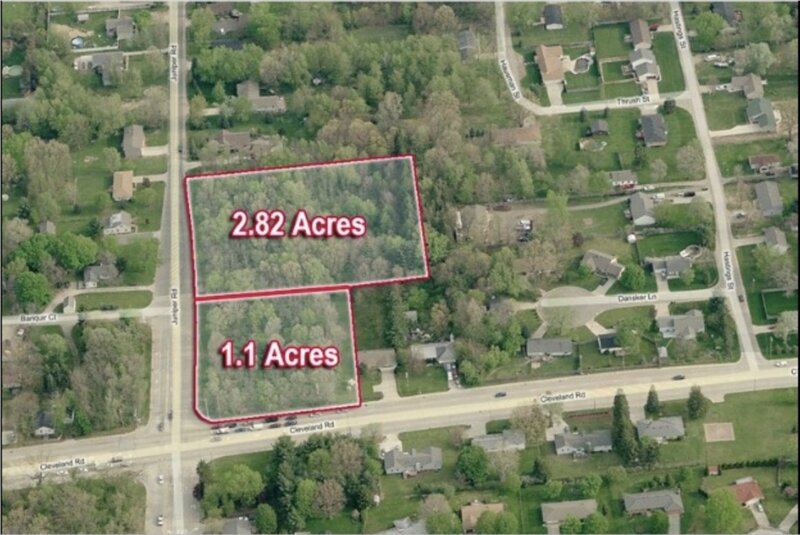 Two contiguous parcels (1.1 acres and 2.82 acres) totaling 3.93 +/- Acres at the signalized corner of Cleveland and Juniper Roads., $315,000 per acre. The property has approximately 181’ frontage on Cleveland and 575’ frontage on Juniper. The site is currently served by gas and electric, private well and septic system, however city water along Cleveland Road and sewer could be brought to site. On a daily basis there are approximately 28,000 cars on Cleveland Road east of Juniper Road, and 21,000 cars on Cleveland Road west of Juniper Road. Broker Owned.